COUNTRY UPDATE MAGAZINE is a glossy world-class country music quarterly profiling international and Australian country music news. Jam-packed cover to cover with features on Who’s Who and What’s New and fabulous - on the road, in the studio and on the airwaves, around the globe and locally. 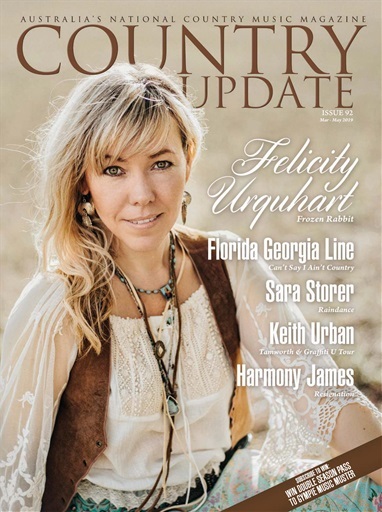 Issue 91 has a four page ‘up close and personal’ with Troy Cassar Daley followed by dozens of great interviews with Felicity Urquhart, Sara Storer, Florida Georgia Line, Keith Urban, Harmony James, The Flood, Bill Chambers, Rosanne Cash....and that's only about half of them. There are pages and pages of magnificent shots and bits and pieces, big 14 pg wrap-up of Tamworth festival plus news and views from our columnists here and in Nashville. There are detailed and insider guides of where to find quality country in capital cities and CD Reviews from both top and bottom of the world - the world of country music! !